According to Landnámabók, the settlement of Iceland began in AD 874 when the Norwegian chieftain Ingólfur Arnarson became the first permanent Norwegian settler on the island. Over the next centuries, people of Norse and Celtic origin settled in Iceland. Early on, district assemblies were formed, but as the population grew there was a need for a general assembly. The descendants of Ingólfur Arnarson who dominated the region of southwest Iceland had become the most powerful family in the country, and other chieftains felt a need for a general assembly to limit their power. Grímur Geitskör was allotted the role of rallying support and finding a suitable location for the assembly. At about the same time, the owner of Bláskógar (then name for the Þingvellir region) was found guilty of murder and his land was declared public and obligated to be used for assembly proceedings, the building of temporary dwellings, the use of the forest for kindling and the grazing of horses. The Þingvellir region was chosen for this reason and the accessibility from the most populous regions of the North, South and West. The farthest distance a goði (chieftain) had to travel was 17 days traveling from the easternmost part of the country where mountains and glacial rivers proved bothersome obstacles. The foundation of the Icelandic parliament is said to be the founding of the nation of Iceland, and the first parliamentary proceedings in the summer of 930 laid ground for a common cultural heritage and national identity. Þingvellir played a central role in the history of the country, and its history runs almost parallel with the history of the Icelandic Commonwealth. The Alþingi (assembly) at Þingvellir was Iceland’s supreme legislative and judicial authority from its establishment in 930 until 1271. The Lögberg (Law Rock) was the focal point of the Alþingi and a natural platform for holding speeches. The Lawspeaker, elected for three years at a time, presided over the assembly and recited the law of the land. Before the law was written down, he was expected to recite it from memory on the Lögberg over the course of three summers along with the complete assembly procedures every summer. Inauguration and dissolution of the assembly took place at the Lögberg, where rulings made by the Law Council were announced, the calendar was confirmed, legal actions were brought and other announcements made which concerned the entire nation. Anyone attending the assembly was entitled to present his case on important issues from the Lögberg. The Law Council served as both a parliament and supreme court. Laws were passed and approved there, and rulings made on points of Law. The Law Council appointed members of the Fifth Court (a kind of appellate court), appointed the Lawspeaker, and took part in the election of the bishop. Unlike the Alþingi, the Law Council was a closed body in which only certain people enjoyed full rights: chieftains who held the office of “goði”, their “Þingmen” and later also bishops. However, everyone at the assembly was entitled to watch and listen to the Law Council at work. From the earliest times until the 15th century, the Law Council met at Neðri-Vellir on the east bank of Öxará, but when the river changed its course around 1500, the council was moved to an islet in it. 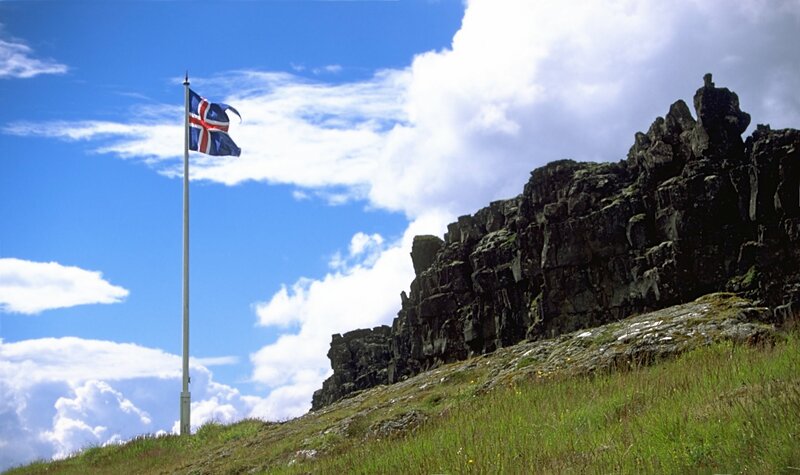 In 1594, the Law Council was relocated to the foot of the ancient Law Rock, where it remained until the Alþingi was finally transferred from it in 1798.